This presentation takes attendees beyond the basics of financial statement analysis in a sophisticated, decision-relevant format. Working through a real-life case study, participants explore the specific techniques of strategic financial analysis. Participants will learn about financial ratios and how to use them to analyze their company’s financial performance and to create change for the future. No prior financial expertise needed. In the second part of Financial Analysis, attendees continue working with the case study and will move from simply identifying the symptoms of financial distress to learn how to solve the problems that cause financial distress and quantify the effect of management inefficiency. Attendees will be introduced to the Cause and Effect Road Map and the Profit Mastery Assessment, two tools they can use to advance the knowledge from Part 1. After this presentation, participants will understand what financial statements really tell them about their business and have the expertise and confidence to take action. Break-Even Analysis is the tool that lets owners and managers gauge the results of changes in costs, volumes, or pricing. Break-Even provides a method to analyze the present to help drive future profits higher. This presentation cuts straight to the bottom line with a discussion of why you need to perform cash flow analysis, how to do it, and the impact it can have on the way you run your company. Participants will build a profit plan and cash budget on a step by step basis. The case study also explores the effect of seasonal sales cycles on cash flow and profits. While growth and recession get measured on the income statement, they’re often paid for on the balance sheet. Without carefully managing your business’ balance sheet to take positive control of growth, you can fall into the “Financial Gap.” This unique presentation allows participants to assess their current survival position, identify the potential costs of future growth, as well as get acquainted with the “Sponge Technique,” an innovative, realistic strategy to wring much needed cash out of a balance sheet. Almost all companies have needs for additional capital at one time or another. 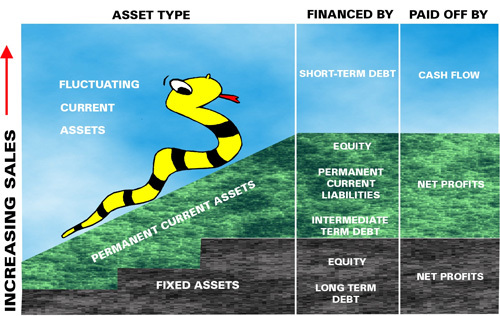 There are many sources of funds for both debt and equity. Regardless of the source, a business owner must tell his or her story in a way that makes sense (and gets results). Learning the secrets to this process is the topic of this presentation. Attendees will also learn how to properly package and communicate information to increase their chances with funding sources. The topic of transition planning is addressed and resources that support this process are provided.